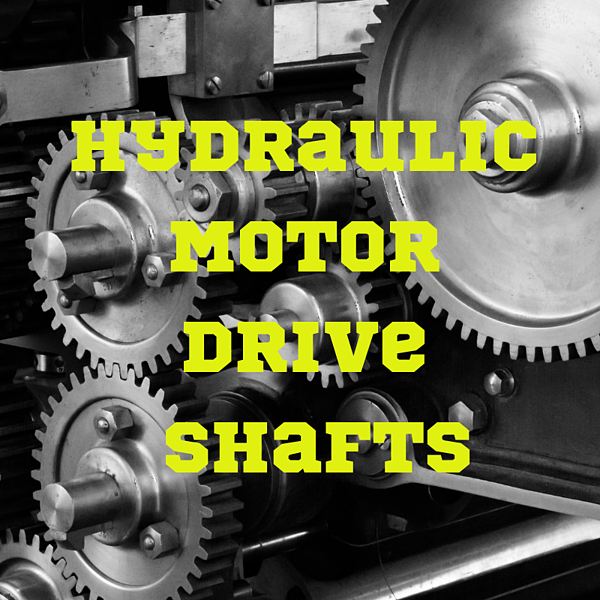 On final drives, drive shafts are typically coupled (upper drive shaft + coupler + lower drive shaft) and splined with a gear ratio of 1:1. The coupler is used to connect two drive shafts to gather, and it also has splines with a 1:1 ratio, facilitating the direct transmission of torque and power with minimal losses. You’ve probably noticed that splines are more like ribs than they are actual gear teeth. This design provides for more contact area and allows the shafts to transmit more torque than would be possible with conventional gear teeth. Splines also last much longer than keys because they better distribute the forces and stresses because all the teeth make positive contact. 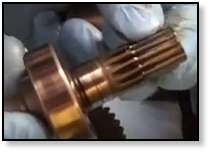 Unlike keys, the ends of splines are chamfered to avoid stress concentrations that can significantly shorten the life of the splines (seen at the bottom of the drive shaft shown). With splines, all the teeth make positive contact and all the teeth/grooves are used simultaneously. In addition, this design allows for shafts to meshed directly, rather than using gears to transmit torque between shafts. 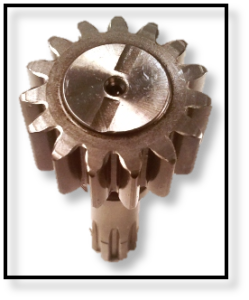 One of the results of the use of splines as opposed to gear teeth is the ability to axially transmit a tremendous amount of power and torque. Couplers connect two shafts together, and while the shafts have positive splines the coupler has corresponding negative splines. These are a common sight in hydraulic final drive motors and are used to link the upper drive shaft and lower drive shaft together with a minimum loss of power and torque. However, the coupler works only as long as the splines on the drive shafts are still intact. The most common sign of drive shaft wear is worn-down splines. 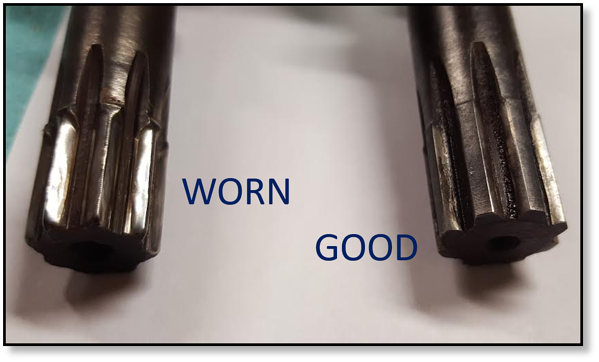 If the spline teeth have a triangular tip rather than a rectangular tip, they need to be replaced because they can no longer efficiently transmit torque and power. The image below shows the difference between worn teeth and good teeth. We were once sent a Kubota final drive motor that would not turn even under no-load conditions. Upon further testing and disassembly, the culprit was discovered: the the splines on one of the drive shaft splines were too worn down to interact with the coupler. That meant there was nothing for the coupler to mesh with in order to transmit rotation, much less torque or power. If either the drive shaft or coupler is stripped, then the final drive won’t work.